it seems like i’m on a breakfast-y kick; 3/4 of the last posts were breakfast. aside from the fact that i like breakfast, it’s my way of baking without baking, the way to have some sort of homemade carb without all the sugar (because chances are, i’m eating 90% of the stuff if i’m at school). these orange-scented almond olive oil muffins are so moist and tender that they can stick to the wrapper badly; they come away a lot more cleanly once you let them cool or on day 2. they have a hint of orange and almond, perfect if you aren’t super into orange zest (i can think a few people who aren’t). they’re lightly sweet, so you can actually eat them as a snack instead of eating them as a snack when you should be counting it as dessert. In a medium bowl, beat the sugar and eggs until pale and thick (you can do this by hand, but highly recommend using an electric/stand mixer so that it gets more air). Beat in the other wet ingredients. In a separate bowl, whisk the dry ingredients. In batches, stir the dry ingredients into the wet ingredients until just blended. Stir in the almonds. Fill 18 lined muffin cups. 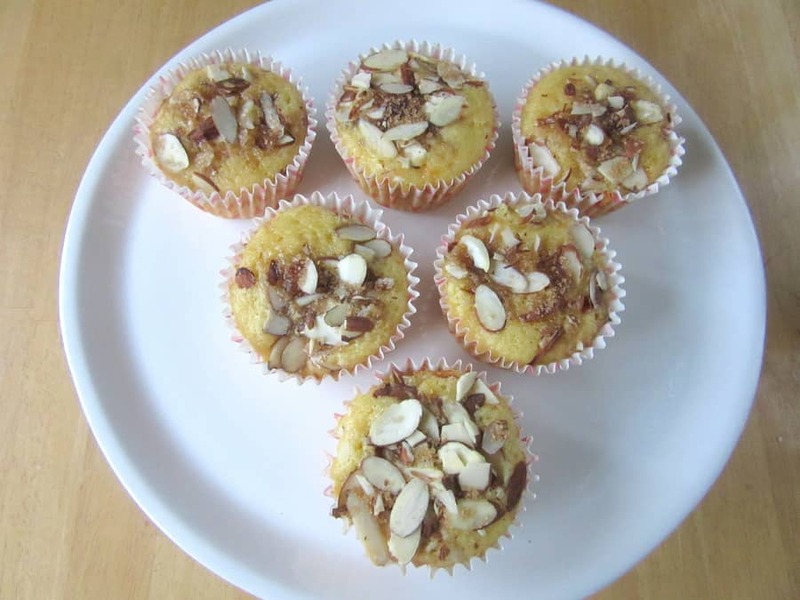 You can save some almonds to sprinkle on top, like I did; press them into the batter so that they stick, if you do this. Bake at 325F until the muffins are golden on top and a tester comes out of the muffins with moist crumbs attached, about 15-20 minutes. Remove the muffins from the pan and cool on a wire rack for 20 minutes. I love breakfast so, no complaints. I've fallen in love with the taste of olive oil in baked goods, I think I'll have to add this to the to-bake list ASAP! same, i love how olive oil makes it a little more savory and more interesting! I'm definitely a breakfast kind of gal, too! Breakfast is quite possibly the best meal of the day. These muffins sound so delicious and simple – everything you could want in a muffin! they’re great for breakfast, but they’re also really tasty for snack too :3 (and then you can carry the breakfast-y theme all day long! ).